The upcoming holiday season can be a time of hustle and frantic moments. We want to help give you a true handmade holiday without all the stress. Follow us over the next 8 weeks as we show you how to make your Holiday Décor and Gifting magical. Be sure to tune in every Monday & Wednesday to our Facebook Live as we walk through some of the tips and techniques to get you through the holiday. Now, let’s jump into this week’s great décor lineup: The Mantel! There are 10 great projects in this collection. Even if you don’t have a mantel, you can find a place to use these signs, stockings, blankets, and wreath. First, let’s check out our materials supplies list. Don’t forget that throughout this 8-week journey, you can use the promo code 8WEEKDIY to get an additional 10% off all your materials (excludes Cricut machines & Cricut Access and needs a $50 minimum purchase). All supplies cost less than $250, and the best part is that with your leftover supplies, you’ll be able to tackle more of the projects in the upcoming weeks. This 8-week program gives you a completely customized holiday for under $500 – for your entire house including the tree!! Talk about an amazing way to truly get a unique experience for the upcoming season. The best part is that you can do all or just a few to brighten up your holiday décor! You will see I picked a core color palette that will follow us throughout the next 8 weeks as well – white/cream, grey, brown, forest green, black, and a few scattered pops of red. I did not want it to be too red heavy as it can be a little overwhelming since it’s such a powerful color. 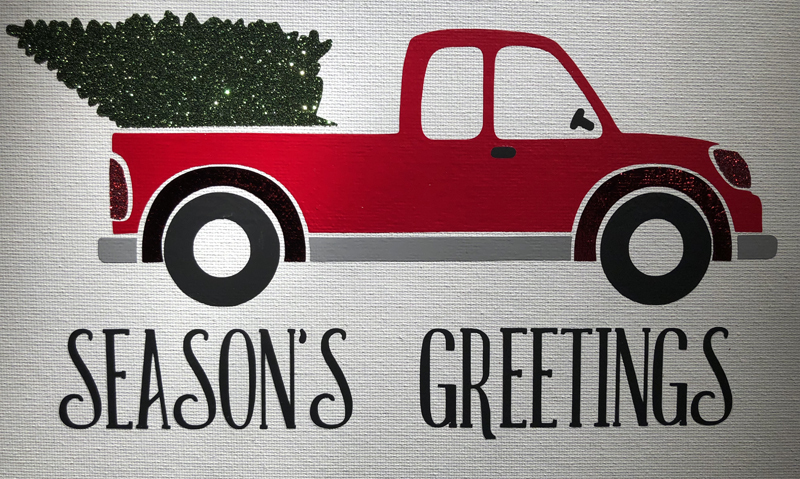 Next, I also selected some main images that you’ll see throughout our cohesive holiday as it comes together over the next few weeks – vintage truck, pine trees/cones/needles, stars, and poinsettias (both red and white!). Finally, I made sure that we are using a lot of mixed media projects with textures sprinkled throughout to give it an enriched look – metallic embroidery, felt pom pom balls, and fuzzy/rich materials along-side pearl paper, holographic party foils, and textured vinyls. I’ll even show techniques on how to bring flat materials to life with embellishments – check out the nose on the Reindeer Wood Sign! To help you embrace a massive make-it-from-scratch holiday, I started the Mantel with 3 custom wood projects. Yep, that’s right. I constructed the wooden frames and plaques from scratch too. Check out our tutorial on how you can make these three DIY Wood Projects too! The next two projects are phrases. I couldn’t quite decide which font I loved the best, so I made two and decided I could put one in another area of my house to bring my favorite phrase throughout the holiday décor – Merry & Bright. This uses both a Black Vinyl (or dark Stainless Adhesive Foil if you prefer) and a Red Stainless Adhesive Foil for the ampersand sign. Once again, bringing in that small pop of red. 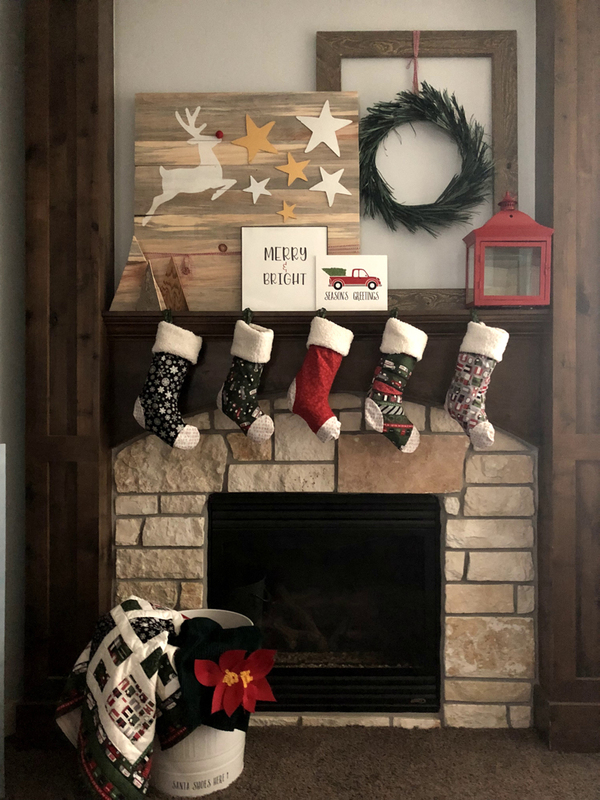 The second phrase incorporates that vintage red truck, which I am loving that is also echoed in the Christmas Delivery fabric of the stockings and quilt. I used another one of my favorite inviting phrases, “Season’s Greetings”, and favorite fonts: Easton. I like how the font plays off of the Felix Font from the Merry & Bright sign where it has both thinner and thicker areas, but the tall feel of the letters give it a matching vintage look to the truck. The truck is actually several layers of different types of iron-on. This technique can be really tricky so make sure to read up on some Tips for Layering Iron-on – especially since it’s using Everyday Iron-on, Glitter Iron-on, AND Foil Iron-on (oh my!). There isn’t much to do except fan-girl over the Riley Blake Christmas Delivery Collection that will be on Cricut.com next week. I can’t wait to show you so many fun things to make with it that are really simple. The stockings were made with this Design Space project. A loop was simply cut into a rectangle and added onto the top of the stocking pattern to hang from the Mantel. A quick tip to hanging the stockings: Command Strips. We talked a little bit about how pinecones would be seen throughout everything, and here is a quick glimpse. 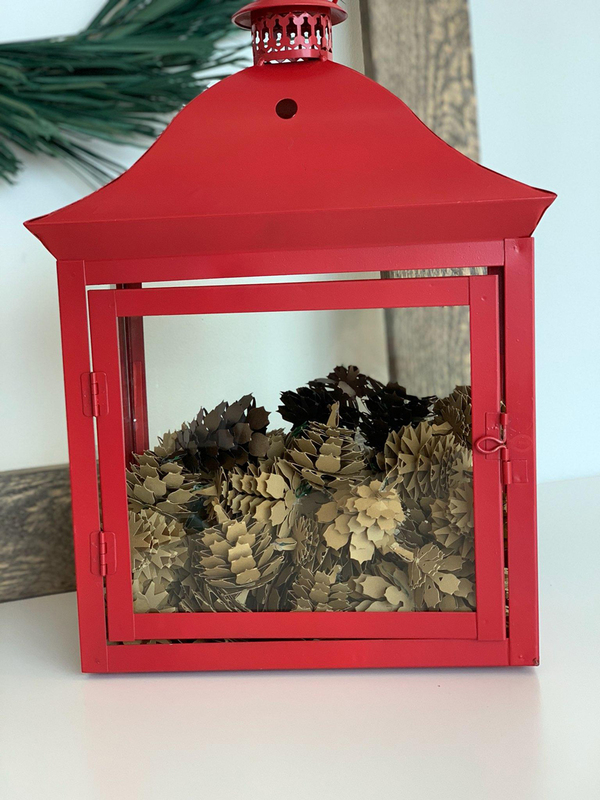 Did you know there are 40 pine cones in the Red Pine Cone Lantern Project? Stay tuned over the next few weeks and we will take you on a tutorial on how to make the pine cones from scratch! The final three projects are at the base of the Mantel near the fire. Two are snuggle blankets, and one is to hold them. At our house, everyone has a holiday blanket so we need a bin to put them in. Enter the repurposed trash can! We took a white trash bin and simply add a phrase at the bottom using the same Easton font from the Truck Canvas. Check out our Facebook Live with tips and techniques used throughout these projects. I can’t wait to show you the projects next week. This is going to be a fantastic DIY Holiday Season! I was wondering when the new line of Christmas paper and materials are coming out. Really like the Christmas delivery and the new card stock but can’t find it yet on the cricut site. It said this week. Just wanted to know when. Super excited for it! Can’t wait to see all the projects! I have been a cricut user for many years ! My biggest problem has been learning how and where to look for tips and ideas.I felt like maybe I wasn’t smart enough until I focused on why it was a problem. I bought a different computer to use with my air2( I’ve had about 2 years. I wore my expression out the LED screen quit.}. Today while scrolling I found these tips and ideas. Unfortunately before I would get so frustrated ! Many thanks and apologies for my bad manners! There is help but you may have to dig to find it. I have had many calls into cricut & they walked me through! Sewing and crafts are very helpful for stress & depression but, you have to set the time aside and plan ahead to not be rushed and overwhelmed! I’m looking forward to learning and growing with my MANY cricut products & ideas ! Thank you ! Ps. This may not be the right place for this but, I thought maybe I wasn’t the only one needing to realize this! Also to not waste vinyl if you’re unsure try it on paper before vinyl! We are trying to cut out the reindeer for the plaque and the Cricut says one of our items is too big to cut. We have a 12×24 mat and I even tried resizing the reindeer down to a width of 10.5″. We have a Cricut Explore Air. Hi. Check to make sure that it hasn’t accidentally been set to Print then Cut. That has a smaller canvas size, so would pop up errors at 10.5″. It’s definitely not a print then cut. I “chatted” with the Cricut support people last night and the same thing happened to them when they tried. They said something was wrong with the image. Has no one else tried this? Make sure none of the image has moved outside the cutting lines of the mat. I’ve had that happen to me before and it solved the problem. Good luck! I just bought the Cricut Maker and so confused. Where can I find the tutorial on how to get started with projects. A project came in the box but I can’t find the instructions. Hi. You can look for help with questions at help.cricut.com. We also suggest watching our YouTube videos and others that people have made.